Luke Marshall touches down for Ulster. 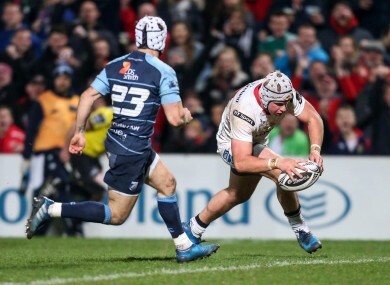 ULSTER’S SIX GAME winning streak came to an abrupt end with a 24-24 draw at home to the Cardiff Blues, a result that deals their top four hopes a significant blow. In an open and fast-flowing game, the sides shared six tries, with both Paddy Jackson and Gareth Anscombe flawless off the kicking tee for their respective sides. The draw does keep Ulster in fourth overnight. However, they would be overtaken by the Scarlets should the Welsh region defeat Treviso at home with a bonus point. Cardiff deservedly opened the scoring through a ninth minute Anscombe penalty after they dominated the early territory and possession stats, with Ulster struggling to clear their lines. But when the hosts attacked, they were deadly. Charles Piutau made the initial break and, with penalty advantage for a high tackle, Ruan Pienaar dabbed a kick through which Paddy Jackson gathered and dotted down unopposed. By now, Les Kiss’ men were on top and they were looking good in attack. However, their unforced errors and slack breakdown work was hindering them greatly. And it wasn’t too much of a surprise when Cardiff retook the lead — Wales flanker Sam Warburton burrowing over for the score despite the hint of a forward pass in the build-up to the try. Back came Ulster though, and they snatched back the lead through a penalty try — the Blues guilty of hauling down a maul that was motoring over the line at pace, sending referee Ian Davies under the posts. And while the Irish province did hold the lead, they would have been disappointed it wasn’t any more than four, especially after they failed to capitalise on Jared Payne’s excellent burst into the 22 off a set move. Instead, it was the Welshmen who scored next, seven minutes after the restart, as the impressive Rey Lee-Lo ran a perfect support line off Anscombe, who showed excellent hands to put him through and under the sticks. Ulster did level the scores as Jackson sent over his first penalty of the night, but the Blues were still looking much the better side and they notched their third score on the hour mark. Again it was the elusive Lee-Lo, who stepped inside Stuart Olding’s weak tackle and then cruised to the try line to put the Welsh region back ahead, with Anscombe adding his third conversion for good measure. But with ten minutes to go the scores were level again — Luke Marshall this time profiting from some weak Cardiff tackling to force his way over for the tying score, converted again by Jackson. At the end it was Ulster who looked the more likely to score, barraging the Cardiff line, but again more errors cost them dearly, and instead they had to settle for two points which does them no good in the race for the top four. ULSTER: Jared Payne (Jacob Stockdale 42), Craig Gilroy (Andrew Trimble 57), Luke Marshall, Stuart Olding, Charles Piutau, Paddy Jackson, Ruan Pienaar; Andrew Warwick (Callum Black 76), Rory Best (Rob Herring 66), Wiehahn Herbst (Rodney Ah You 66), Kieran Treadwell, Alan O’Connor (Robbie Diack 63), Iain Henderson, Sean Reidy, Roger Wilson (Nick Timoney 63). CARDIFF BLUES: Rhun Williams, Alex Cuthbert, Rey Lee-Lo, Willis Halaholo, Blaine Scully (Matthew Morgan 12), Gareth Anscombe, Lloyd Williams; Gethin Jenkins (Corey Domachowski 69), Matthew Rees (Kirby Myhill 57), Taufa’ao Filise (Kieron Assiratti 40), George Earle (James Down 27), Jarrad Hoeata, Ellis Jenkins, Sam Warburton (Nick Williams 37), Josh Navidi. Email “Ulster's Pro12 play-off hopes take a hit with Cardiff Blues draw ”. Feedback on “Ulster's Pro12 play-off hopes take a hit with Cardiff Blues draw ”.